especially when it’s Martha Stewart’s Wedding Blog!! I was so so super excited when Yifat Oren gave me the word that Kristina & Jesse’s Wyoming wedding invitations were shown by Martha this morning. HOORAY! I felt like Tiny Pine Press hit the wedding blog jackpot!! I love this invitation. It’s classic Tiny Pine. I mean, there are pine needle clusters stitched on every invitation. Can you get more piney? The save the dates were also one of my favorites… with the tinted photograph of the property delivered to the guests, giving them just a peek at where they would be traveling to. 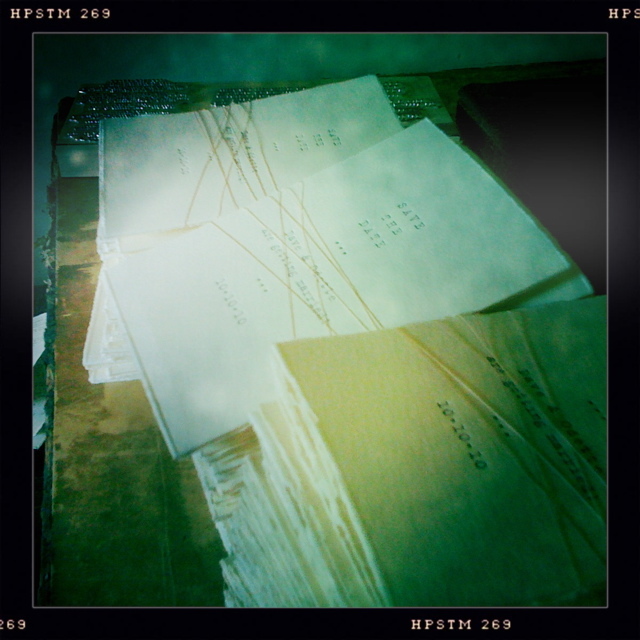 Thanks to Yvette Roman for the pretty photo of the stationery! This entry was posted in invitations, paper, printing, recycling, stationery, wedding invitations and tagged Letterpress, printing, soy based ink, Tiny Pine Press Variations, wedding invitations on June 29, 2010 by tinypine. This week I finished a sweet trifold letterpress save the date cards in my favorite tyepwriter font. As I was feeding the press, mashing the letters all at once, I thought about how much easier we have it these days, that I only had to type these letters all out one time (or actually, copy and paste) and the ink up the press, just passing them through the clam shell individually. Not to dismiss the work! these cards were all scored, hand torn, and hand fed, scored, and the tied with two colors of thread. Still a lot more organic than just pushing print. Plus sustainable on cotton paper, with soy ink. these cards may look charcoal and ivory, but they are really green! and look soooo vintage. 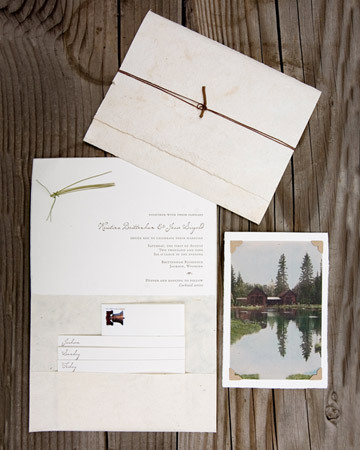 This entry was posted in art, energy conservation, invitations, paper, printing, stationery, tree free paper, wedding invitations and tagged green, Green wedding invitations, Letterpress, printing, soy based ink, tiny pine, vintage, wedding invitations on June 27, 2010 by tinypine. too many good things to choose just one. 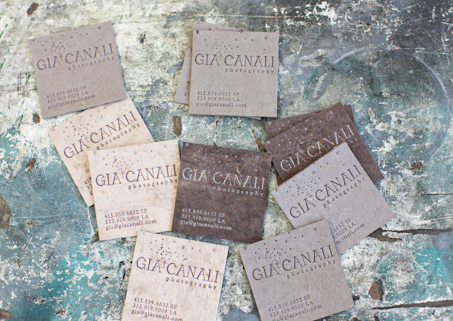 When Gia Canali and I sat down to figure out her new business cards, we instantly fell in love with a few different combinations. She wanted to have something very organic and earthy feeling, but Gia’s photography really is magical, so we needed to get that in there too…. so earthy and l0vely but not sturdy enough to make a card out of (but definitely durable enough to make an outfit from… that’s coming soon). we would have to mount it onto a thicker card. A Super AWESOME bonus about this faux leather is that the dark brown side is pretty great, but the reverse side is a delicate soft pink color. Here begins our dilemma. We will end up using both sides. For the cover weight base stock, we used one of my very favorite handmade papers in this muted plummy color. This is where we get our “magic”. This cottony stock is full of sparkle. Mounted, trimmed, and printed in two runs… Gia wound up with 4 variations or so for her business cards. Isn’t that fun?! ps… these photos were taken by Gia… of course!! 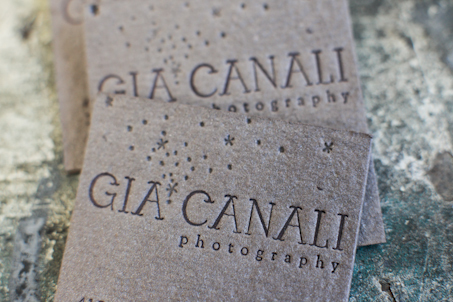 This entry was posted in art, paper, photography, printing, stationery, tree free paper, Uncategorized and tagged business cards, Gia Canali, green, Letterpress, printing, soy based ink, vintage on June 16, 2010 by tinypine.